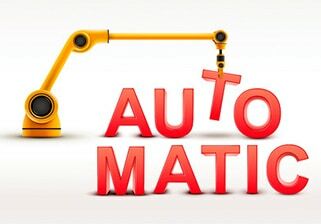 This is a guest post (Danielle McLeod) from a partner who has supplied to us content that we thought might be of value to our readers. To support their work they earn a commission if you purchase through some of the links listed below at no additional cost to you. This does not influence their opinion, but they believe in transparency so you can make informed choices. Read more here. If you live in a zone where your ground freezes come winter, and you have an inground sprinkler for your garden and grass, then you need to consider winterizing the system to keep any remaining water from freezing and causing potential pipe and sprinkler head damage. Since underground systems can be rather costly to put in – repairing and replacing them doesn’t come cheap either. I inherited my automatic Hunter system upon purchase of my home, and basically gave myself a crash course on it’s use through a lot of internet web searches. As the first winter rolled in, I didn’t have a clue about what sort of cold weather care it needed and simply plugged in a heat tape around my overground pipes. Luckily it was a mild winter, but by the following year I had learned how simple and quick it was to winterize my system with an air compressor without having to have the added cost of an extra electric pull each month. I used an air compressor to clear my sprinkler zones and explain those steps below, but there are a few different ways to achieve this effect no matter whether you have an Orbit, Rain Bird, or Toro system that I will explain as well. 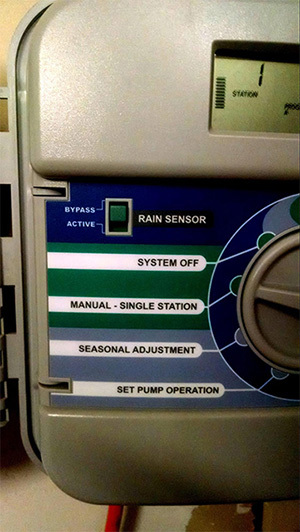 Read on to find out how to efficiently winterize a lawn sprinkler system below! Actually, you really don’t need whole lot to be successful at this. If you don’t have an air compressor that is strong enough for this, and you can’t borrow one, buying one isn’t a bad option since paying a company to do this will on average cost four times the amount the cost of a compressor. Or, you can usually rent one fairly cheap too from a local hardware store. You’ll need at least a 10 cfm strength to provide enough power to run air through most systems in short enough bursts to keep from overheating the piping. 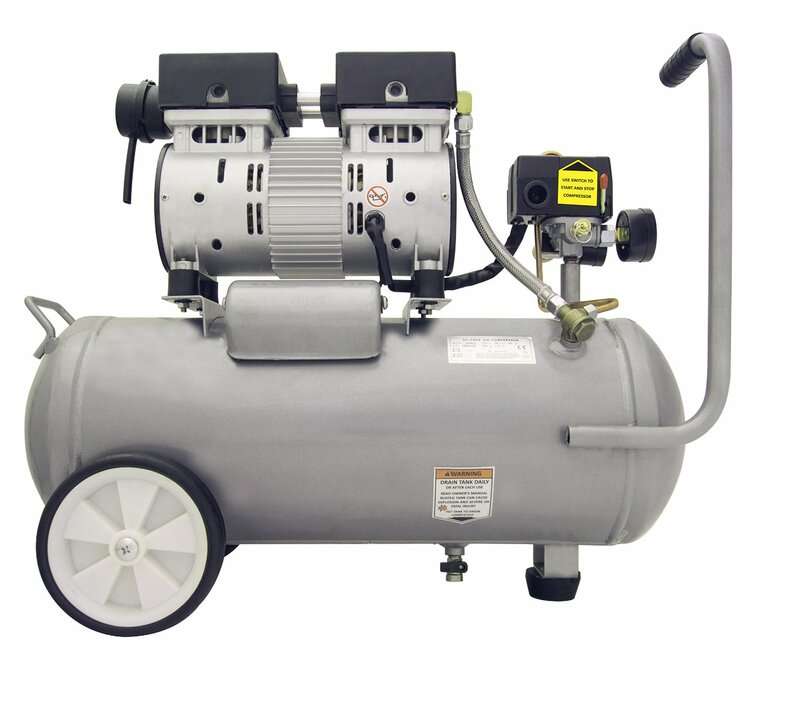 The simplest, quickest, and most effective way to winterize your system is to blow it out with an air compressor. This ensures that the line is clear and dry regardless whether it is a white PVC pipeline or a black polyethylene piping. Be sure to note what type of piping you do have, and if you are unsure, assume it is black polyethylene to avoid damaging the line. Air compressor regulators control the amount of air that flows through an air compressor, and is especially important to take note of when using in conjunction with materials that might be sensitive to pressure. Be sure to use a compressor that is fitted with one, like this commercial grade system I show. The piping that is used in your sprinkler system line can only handle so much pressure and you’ll want to keep the pressure at 80 psi (pounds per square inch) or below for PVC, and 50 psi or lower for polyethylene to avoid unwanted damage and replacement of the line. Underground systems have a main shut off point that are usually pretty easy to locate. They will be located near the initial water source and are typically equipped with two ball valve, “T” shaped lever located on the backflow preventer for easy shut off. These turn off the water without turning off water to the house, and you’ll want to make sure both are turned perpendicular (shut) to the main lines. In some systems you may have a gate valve (as shown), which looks just like a regular water house spigot. These can attract a lot of dirt and dust into the threads over time, so be sure to turn carefully and do not force the line. WD-40 can be helpful if your valve is sticking. Depending on the system your water operates off of, you may not have a backflow device, and if this is the case, then you can skip to step 3 and start draining your system. On your control panel, set your system to have only one zone open at a time in order to flush each out in a controlled manner. My Hunter system allows me to manually choose a single station at a time. Start with the zone farthest from the system and work in. This allows the residual pressure to release and keep it from being pushed into the compressor. You’ll eventually blow out each line twice, and since you don’t want to run the compressor through each for too long of a time to avoid overheating, this will ensure you have cleared it out completely. The line that connects to your inground zones should have a blowout port attached, and if you remove the plug, you can screw in a quick connect hose adaptor. Simply snap on your air hose to this point and run it back to the compressor. If you live in an area where the ground doesn’t freeze very deep, or often, then you may not have this access. If you want one you can hire a company to come in to install it. But chances are you have a sprinkler system that can manually or automatically drain on it’s own. You’ll find instructions on how this works below. Double check that your air compressor regulator is set for the correct piping, and then hook up your air hose to run. When you turn on your compressor the sprinkler heads should pop up and spray out the water in the line. 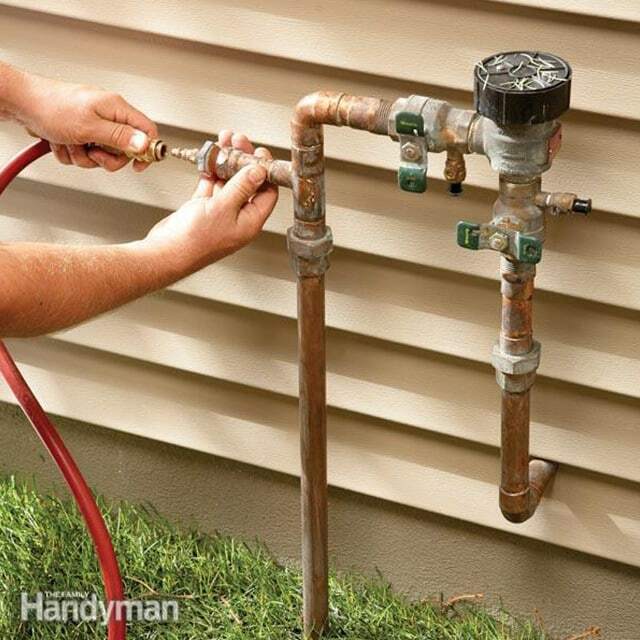 Disconnect your hose immediately as they run dry to keep from building up unnecessary heat. This should take approximately two minutes each depending on size and distance from the air source. I’m repeating this part of the above step on purpose to stress the importance of disconnecting the line as soon as you see your lines are running dry. If you have a zone that is farther away from where you have clear sight, have a dependable person keep watch for you. Air compressors built up heat which can easily damage your piping and result in melted plastic gears in less than a minute without the water present to provide cooling. Repeat steps 5 and 6 for each zone, and then repeat the process for a total of two times for each zone. This will ensure that you have either cleared, or removed enough of the water to avoid any freezing and damage that will occur over the winter. A small amount of water left in a line will rarely cause any damage since it will have room to expand as it freezes. But if water has settled into any of the head gears without any sort of drainage this can possible cause future problems, hence the importance providing some sort of winterization. Some systems are setup to drain without an air compressor. If your system has a manual drain valve at the ends and low points of an irrigation system, you can simply open all these valves after shutting off the water supply. To make sure this has been effective, open the drain valve (or cap) on the stop and waste valve and drain all the remaining water between the backflow and shut off valve. If your sprinklers have check valves you’ll need to pull up the sprinklers to allow water to drain out the bottom. Be sure to leave open the manual valves until you know the water has drained. 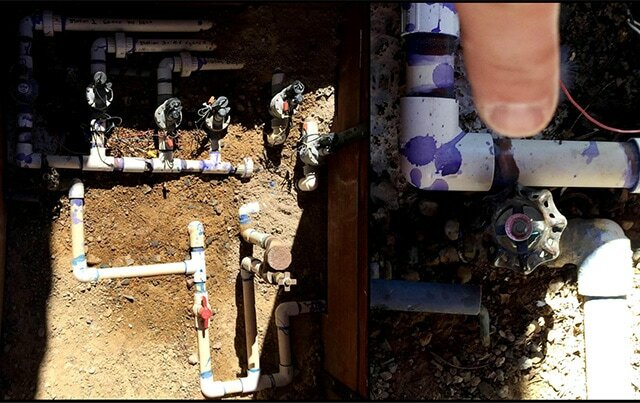 Automatic drain valves are located at the ends and low points of the irrigation piping like manual valves are, however these open automatically when pressure drops below 10 psi. You can activate these by turning off the water supply and activate a station to release pressure. As with the manual drains, you’ll need to drain remaining water, and also pull your heads if check valves are present to allow water to drain. If you live in an area where your ground will freeze, you’ll definitely want to winterize your system in order to keep from in ground pipe damage from occurring. 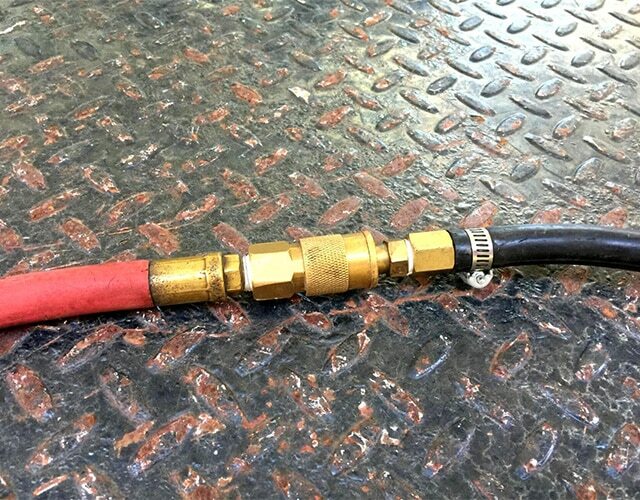 Be sure to know what kind of in-ground system you own, and what materials your piping is made of to avoid issues with the air compressor if you use this technique. 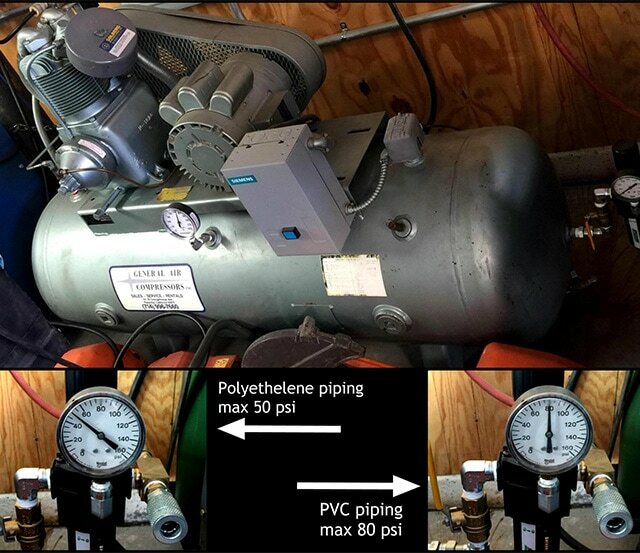 There are a few things to keep in mind, namely that you should never exceed the recommended PSI for your pipes, and you should never stand over parts, or leave the compressor unattended. We hope you found this info helpful, and as always, we’d love to hear of your own tricks and comments concerning what works well for your systems.